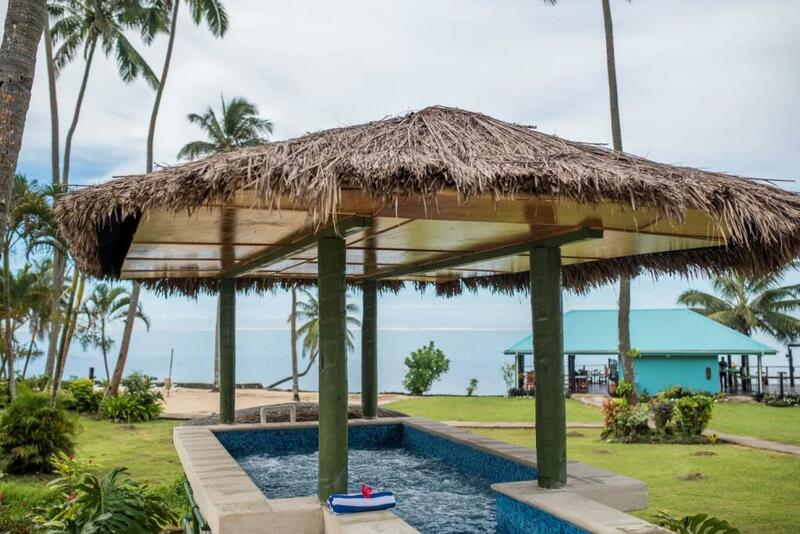 Crusoe's Retreat is a traditional Fijian resort nestled amongst tropical gardens, a palm fringed white sandy beach and only two hours from Nadi Airport. 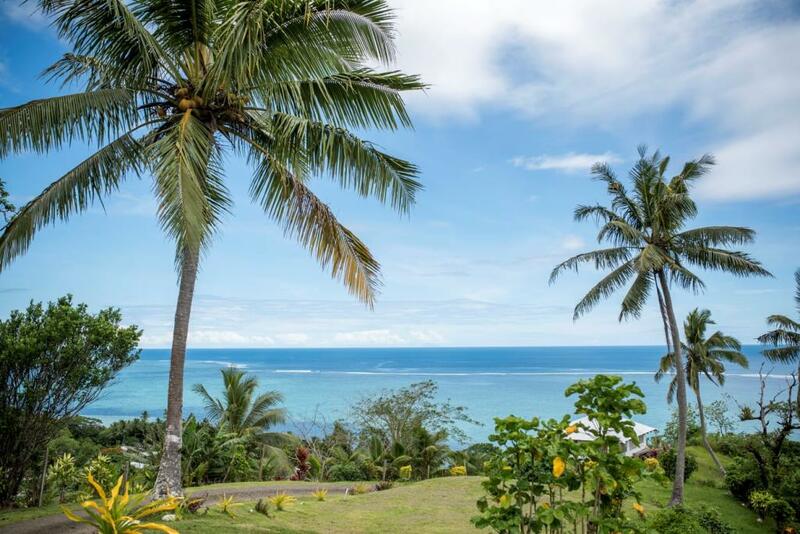 This Fiji accommodation is set on 10 acres of gardens surrounded by native vegetation and located next to the Namaqumaqua Village, a genuine Fijian village where many of the staff live. 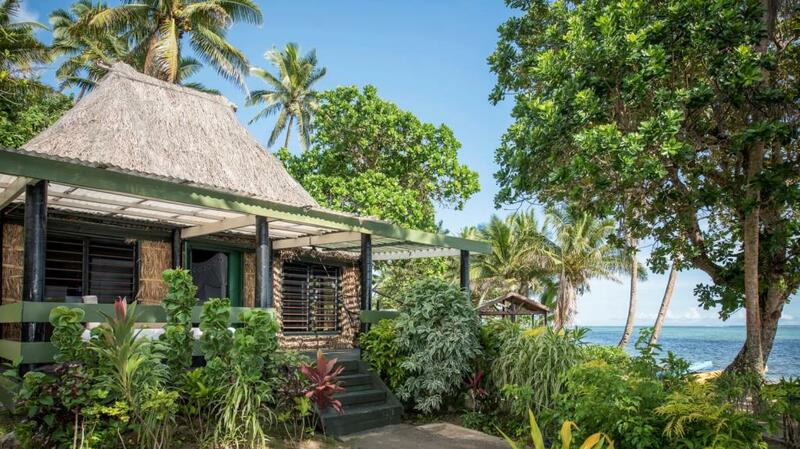 Crusoe's Retreat on Fiji's Coral Coast consists of 28 bures positioned throughout the tropical gardens or overlooking the beach and ocean. 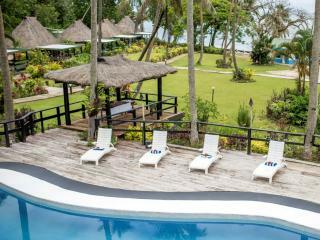 The resort facilities at Crusoe's Retreat include an outdoor pool, bar and restaurant, games room, dive centre and boutique. 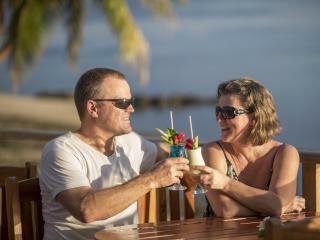 Relax at the restaurant and bar in the evening to enjoy the spectacular sunsets from the deck. The onsite PADI Dive team offer introductory scuba classes in the pool, or for more experienced divers, enjoy the amazing marine life at one of the 20 dive sites within minutes of Crusoe's Retreat. 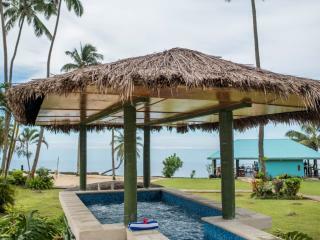 Enjoy the relaxed atmosphere, traditional village surroundings and amazing dive sites of Crusoe's Retreat on your next Fiji holiday with the family. 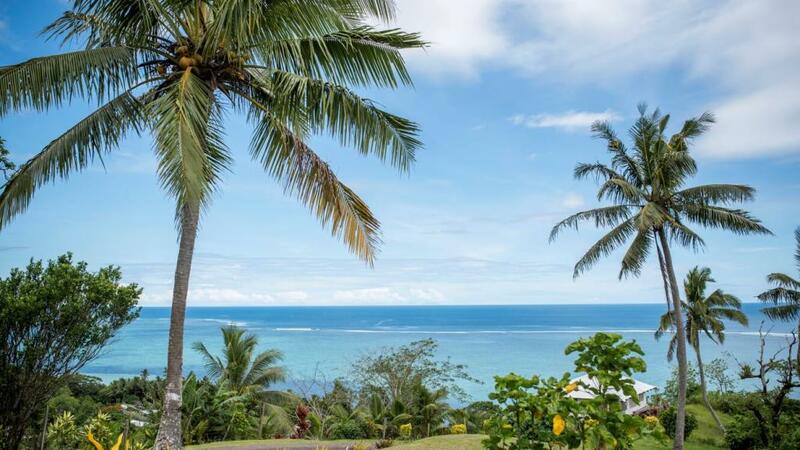 Crusoes Retreat offers a choice of 28 comfortable Seaview and Seaside Bures set amongst lush tropical gardens with views over the gardens, beach or ocean. 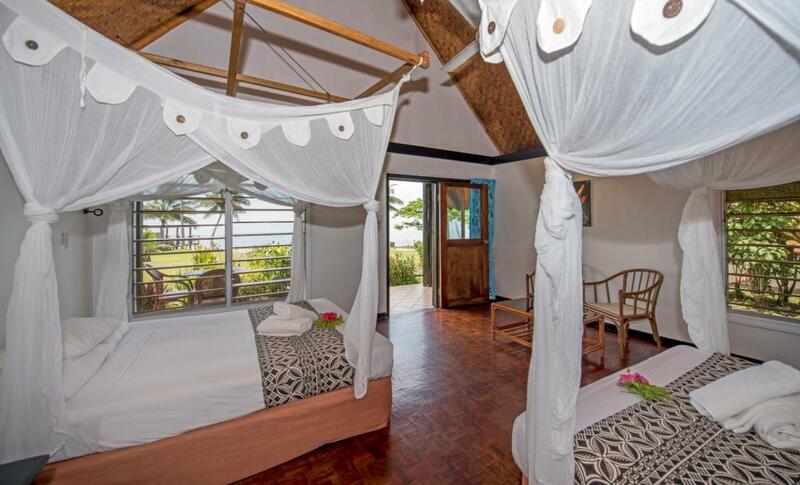 The luxurious Deluxe Seaside Bures offer traditional thatched roofs, timber beamed ceilings, polished hardwood floors and are situated close to the beach. 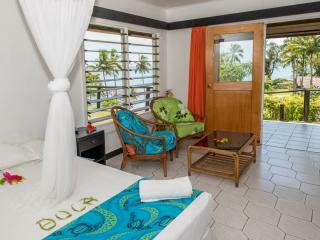 Seaview Bure: Ideal for couples or single travellers, these bures share a common wall (bathroom wall) but have their own private entries. 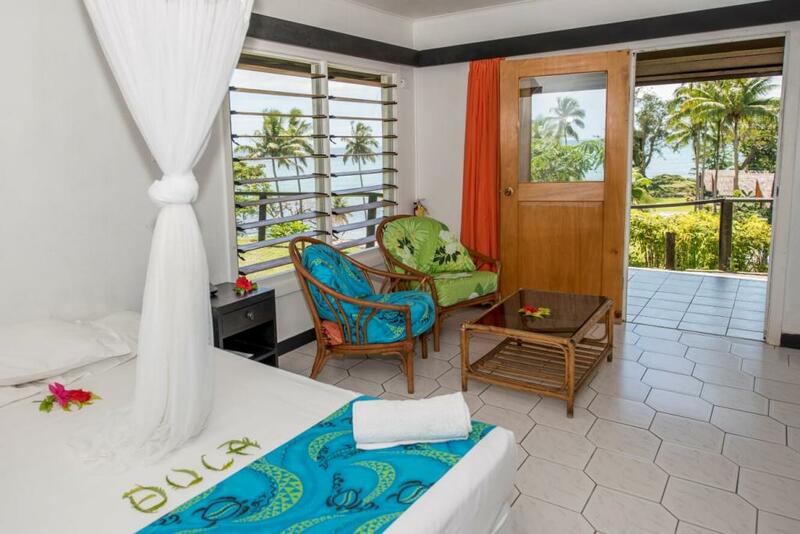 Featuring a cosy sitting area, ensuite bathroom and private veranda, these bures offer sweeping views of the resort, beach and ocean. Bedding is 1 Queen Bed. Maximum room capacity is 2 Adults. 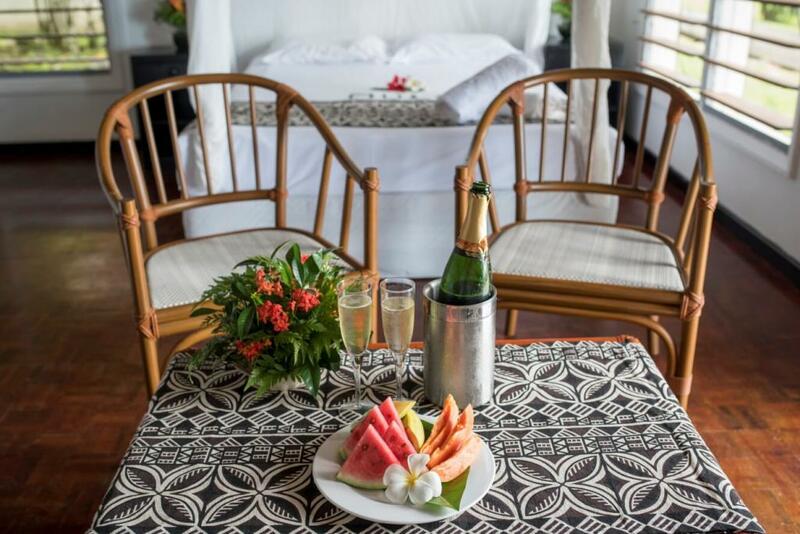 Deluxe Seaview Bure: These free-standing bures are suitable for singles, couples and families and feature an indoor sitting area that opens out onto a private balcony providing stunning views of the resort, beach and ocean. Bedding is 1 Queen Bed + 2 Single Beds OR 2 Queen Beds. 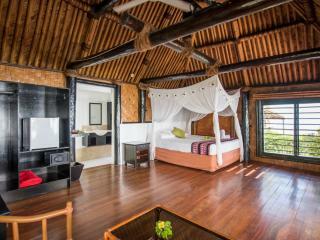 Maximum room capacity is 3 Adults OR 2 Adults & 2 Children Valid until 31 March 2019. 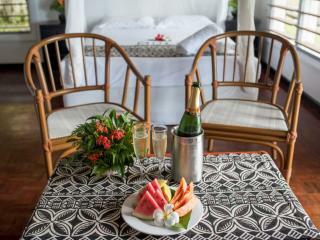 From 1 April 2019 this is an adults-only resort and Maximum room capacity is 3 Adults. 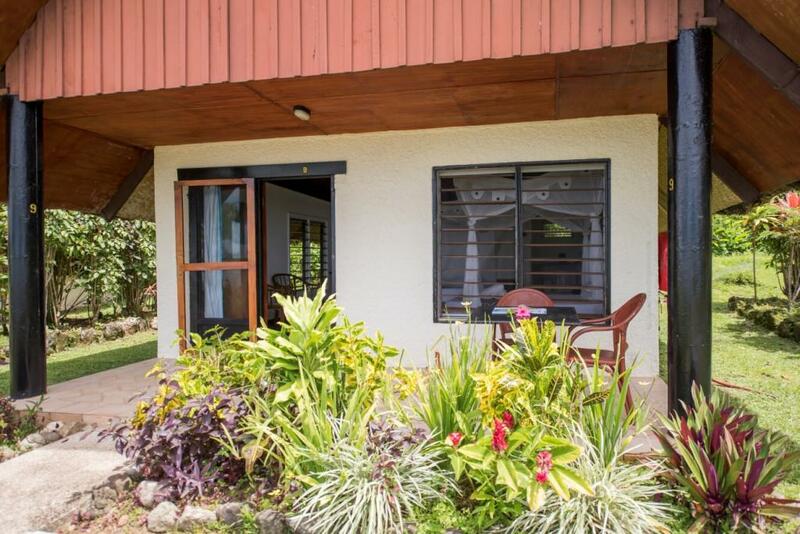 Seaside Bure: Set in exotic gardens, these open air bures are close to the beach and feature a comfortable sitting area opening out to a private veranda with beach and ocean views. Bedding is 1 Queen Bed + 2 Single Beds OR 2 Queen Beds. 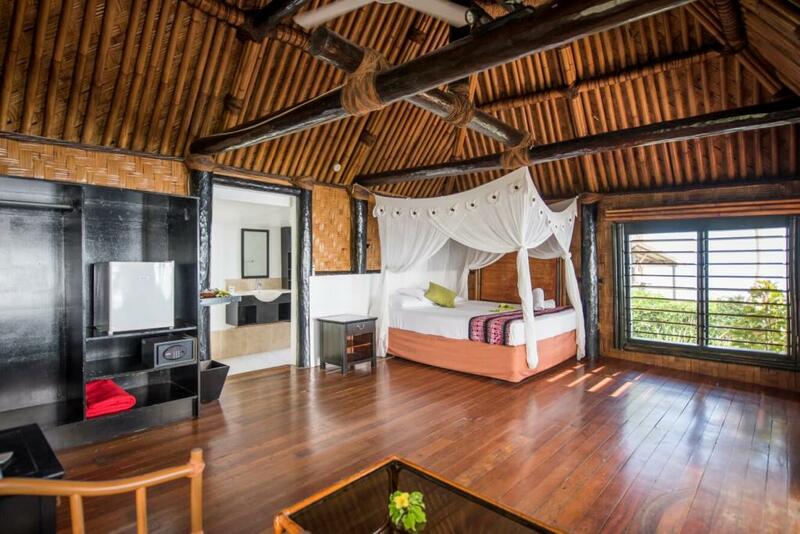 Maximum room capacity is 3 Adults OR 2 Adults and 2 Children Valid until 31 March 2019. 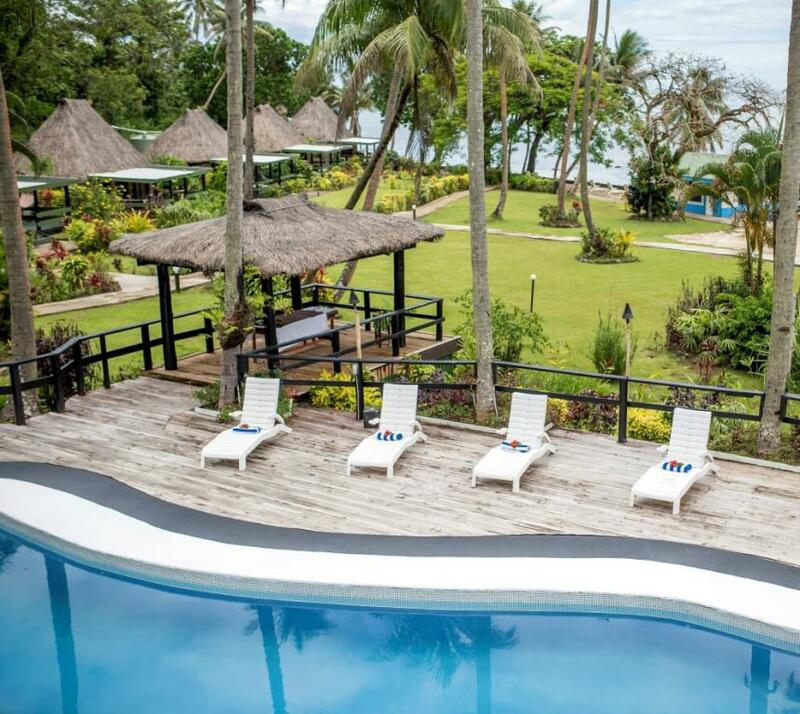 From 1 April 2019 this is an adults-only resort and Maximum room capacity is 3 Adults. 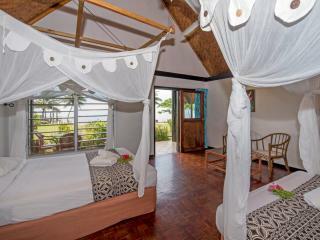 Deluxe Seaside Bure: These traditional thatched roof bures are situated close to the beach and are suitable for couples only. Soaring timber beamed ceilings, polished local hardwood floors and ratten-lined walls are perfectly complemented by more modern comforts such as air conditioning, ensuite bathroom opening out to river rock outdoor shower and furnished veranda with a private hammock. Bedding is 1 King Bed. Maximum room capacity is 2 Adults. Coco's Pool Bar: While watching a breathtaking sunset over the Pacific Ocean, choose from a variety of tropical cocktails and a choice of local and imported beer and spirits. 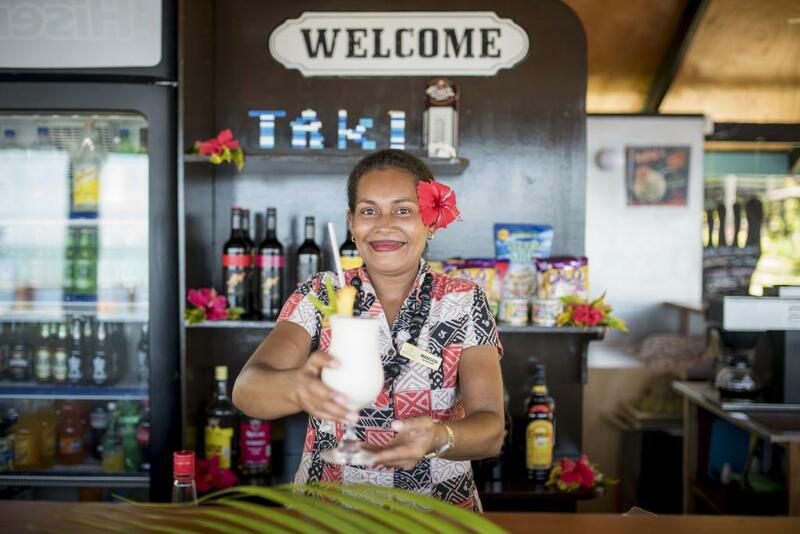 The cries from the friendly Fijian Warriors, followed by the beating of the Lali Drum, along with the torch lighting ceremony signals the beginning of Happy Hour. 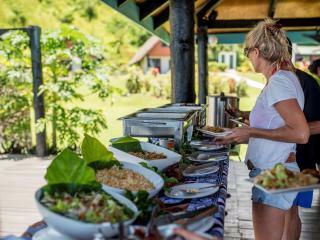 Restaurant Deck: Enjoy spectacular panoramic views as you enjoy the freshest local produce including steak and seafood. 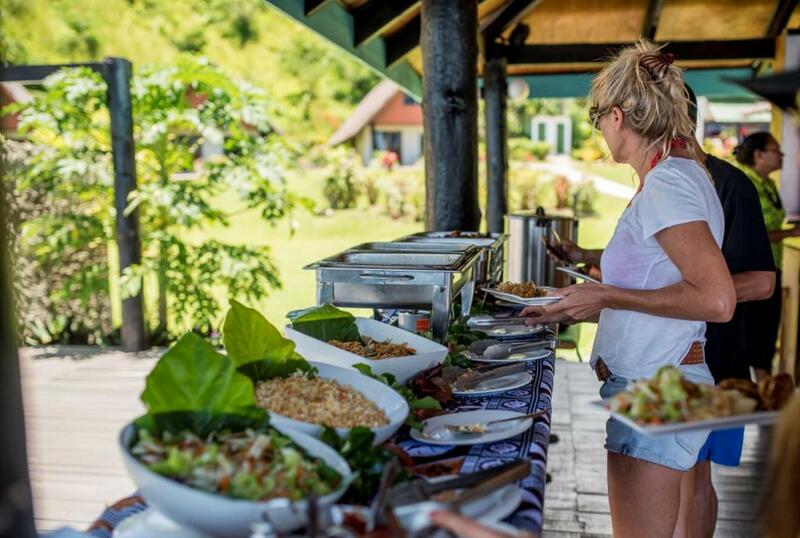 Traditional Fijian Lovo: Once per week the traditional Fijian Lovo is served under the stars on the poolside deck. After your meal you will be entertained by the Namaqumaqua Village Meke dancers. 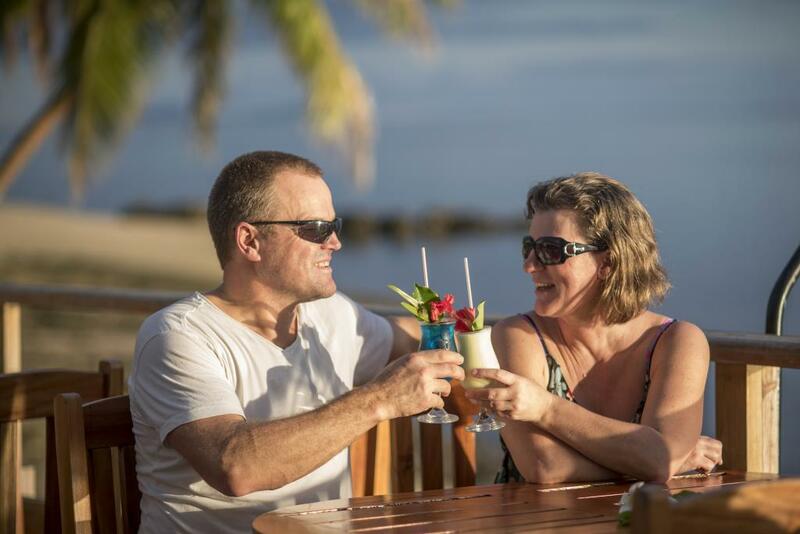 Each evening you can enjoy the "Bula Hour" welcome which signals that start of happy hour at the Frangipani Bar. 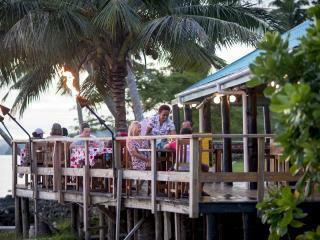 The Fijian band serenades guests while they dine and throughout the evening. 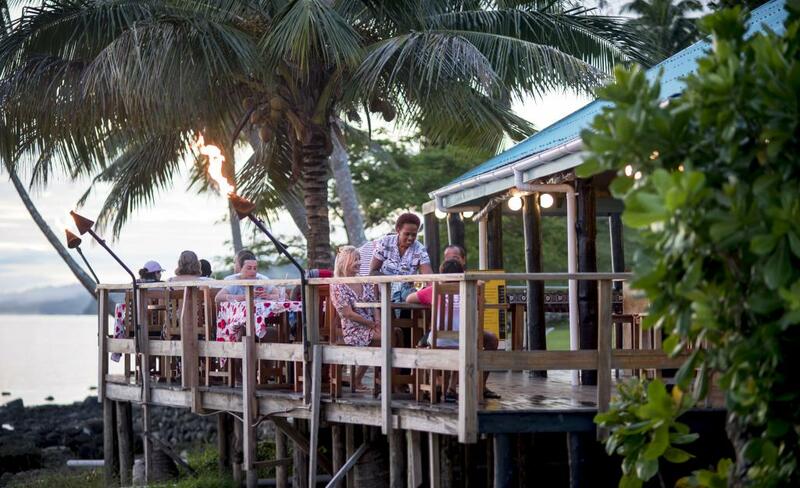 After dinner there are often typical Fijian entertainment such as kava ceremony, Meke dancing or the long time favourite of frog and crab dancing. 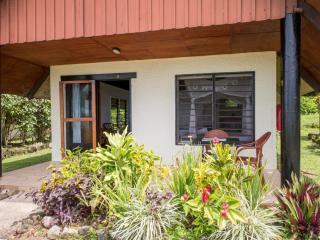 Crusoes Retreat offers a PADI Dive Centre and features more than 20 fantastic dive sites within minutes of the resort. Dive Crusoes offers a range of diving options from beginners to advanced. 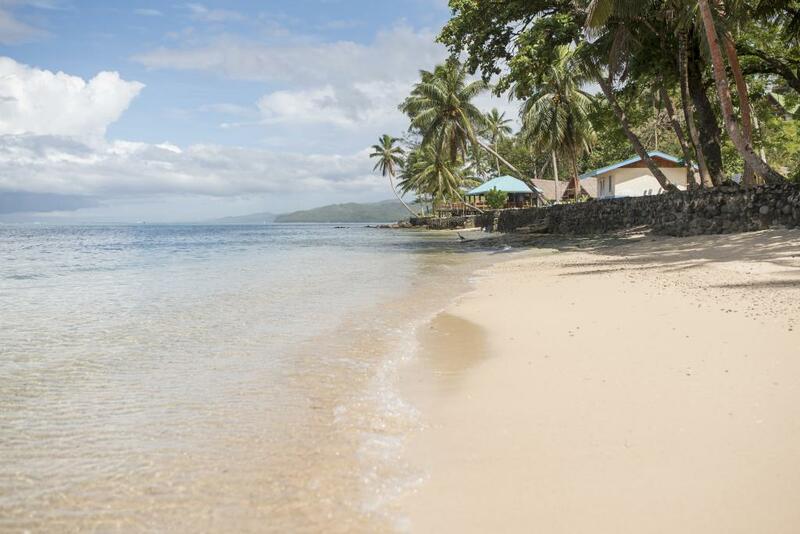 The dive sites are in excellent natural condition and offer a variety of marine life and amazing coral which makes this resort perfect for diving in Fiji. Coco's Spa: Feel refreshed and relaxed with a soothing treatment or massage at the day spa. 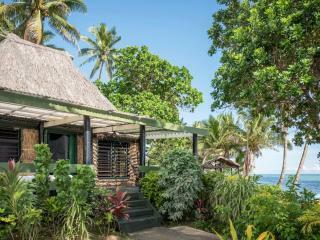 Featuring locally produced products from Organic Earth Fiji, Coco's Spa endeavours to spoil you in the most natural way. 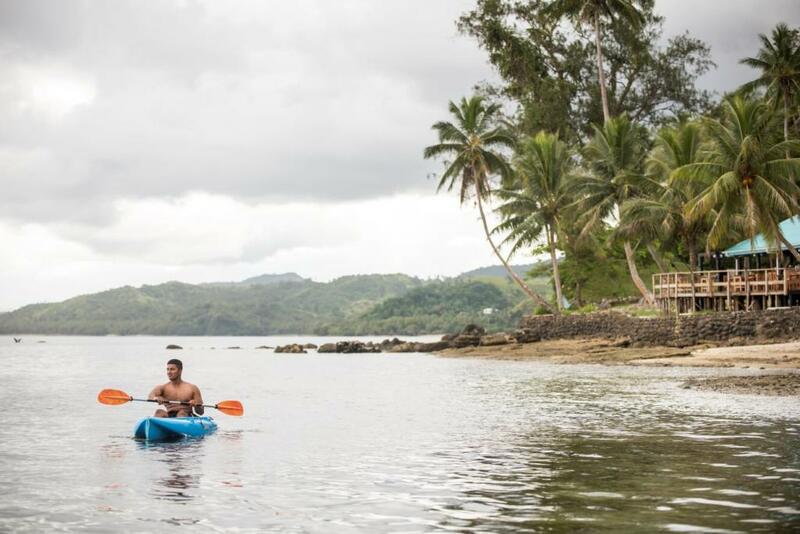 Crusoes Retreat offers a range of magical settings around the resort to exchange your vows. The stunning white sand beachfront is ideal for a sunset wedding or the tropical gardens inspire romance with panoramic views of the reefs and turquoise lagoon. The neighbouring Namaqumaqua Village plays an integral part in the ceremony providing a traditional Fijian influence. 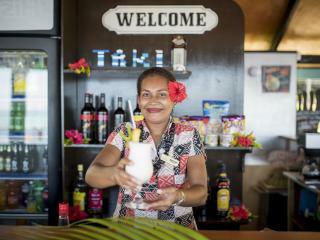 The floral leis, bridal headpiece and tropical bouquets are all handmade by the village and the staff at the resort. Each ceremony is as unique as the couple themselves. 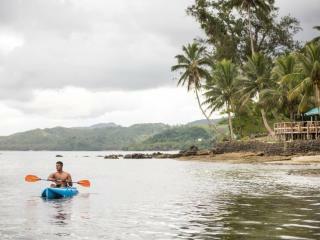 The wedding coordinator at Crusoes Retreat will ensure your Fiji wedding is truly unforgettable.